When I was pregnant, I made the decision, with the support of the antenatal midwife to formula feed from birth. I know that this isn’t the case for a lot of people. Not everyone is able to feed the way they had envisioned or with the support that they need. I know that my circumstances make me privileged. I have the education and the life experience to be able to formula feed without too many issues. However, after looking back at the support I did receive, I’ve realised that it was seriously lacking. Breast is best, until it’s not. The reality is that there are women who are formula feeding their children, and I think it’s important to have supports put in place. These supports should be offered regardless of how a baby is fed. I understand the hospitals hesitation towards providing information about formula. Health professionals have worked hard to normalise breastfeeding and to provide adequate information about the benefits of feeding a baby with breast milk. Formula is commercially produced, and there is always the risk that the information available could become skewed by a formula company. However, I do think that it is possible to offer neutral information and support to families who formula feed. There have been news stories of parents who water down formula because they can’t afford two tins this week and don’t realise it’s harmful to their newborns. Or the families who use juice/cows milk because they haven’t been given enough information about feeding their infant. Their parents did it, and their child health nurse doesn’t want to know that they’ve stopped breastfeeding. Wouldn’t medical support be better in these situations? While I was formula feeding my son, the biggest source of support, information and anxiety was online. I was part of groups and forums where questions were asked and support for those bad days were given. However this support was tainted when other women took it upon themselves to post pictures of their successful breast feeding relationships with captions like ‘I refuse to poison my baby’. It was a kick in the teeth for the women who struggled with how their feeding journey had turned out. I wonder if these same women would be OK with posting a picture of their healthy baby on a support page for stillbirths? Formula feeding isn’t straight forward, it’s not as easy as it is made out to be. It’s not the easy way out. I don’t think that offering vulnerable women information and support should be limited to women who breastfeed. 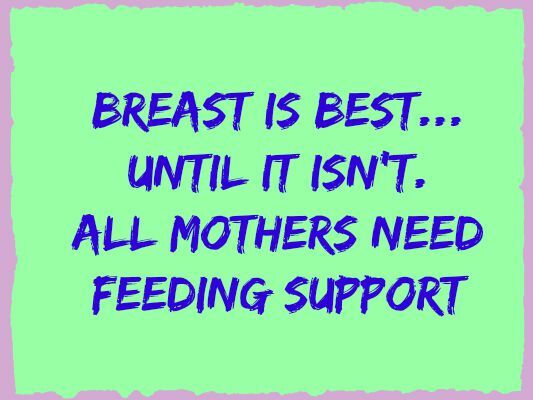 Mothers need support, regardless of whether their child is breast or formula fed. Do you think that formula feeding families need more support? This entry was posted in Parenting and tagged controversy, health, parenting on August 7, 2015 by Tegan.